With hot jam doughcakes on the menu, it's hard not to be a bit piggy. Sydney Road has long been synonymous with salivation. It hubs just about every cuisine, over every price range, of every quality and seems to be suited to any meal, with restaurants, cafes and bars all within walking distance from each other. But Sydney Road's newest instalment, Two Little Pigs Charcuterie & Grind, might just have every Brunswick diner cementing two feet on the ground, dismissing any future suggestions of eating elsewhere. Because the food here is addictively good, and dangerously so. This newly opened cafe focuses on the two king pins of the culinary world — coffee and bacon. The 'charcuterie' in its title translates loosely to the 'home of bacon-sperts'. That means, the bacon isn't just your run-of-the-mill oink oink, smoke smoke, fry fry brekky delight; here, the cuts are fat, succulent and defend the existence of charcuterie as a craft. The mushrooms are cooked in duck fat, the bread is grainy, fresh and the kind that doesn't give tummy cramps, and their doughcake special is a selling point in itself. 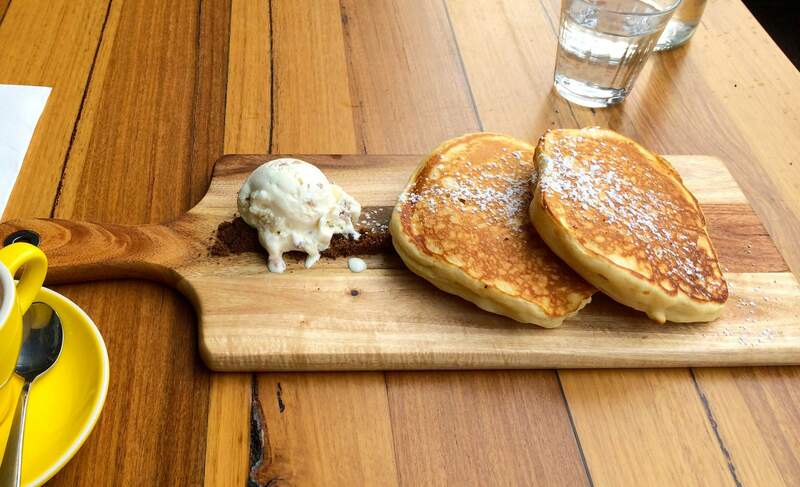 Similar to a pancake, the doughcakes are twice as thick, three times as doughy, filled with tasty hot jam, dusted with icing sugar, and served with a scoop of bacon ice cream that complements the flavours on show. It's one of the only vegetarian options on the menu, so unless you're feeling a lapse coming on — if you're going to have a day off the vege-train, do it here — opt for the doughcakes (maybe without the bacon ice cream). The most dangerous part of Two Little Pigs is that the prices are reasonable. The bacon and eggs are $12.50 and the doughcakes are just $13. That's less than weekly instalments of life insurance. Which you will need if you have weekly instalments of doughcakes. It's a painful Catch 22. Two Little Pigs plate up food and drink that's difficult not to inhale. And trust us, you'll want to. Every chemical, physical, and foodie desire in your body will spur you to engulf your meal like this dog. But you mustn't; the food here is simply too good not to take your time with. We suggest you partner your meal with The Age quiz, a friend who asks a lot of questions, or maybe even an addiction mentor, purely so you don't eat without savouring the beauty that is crafted into these dishes. Because if there's one thing it's hard not to be at Two Little Pigs, it's one big piggy.